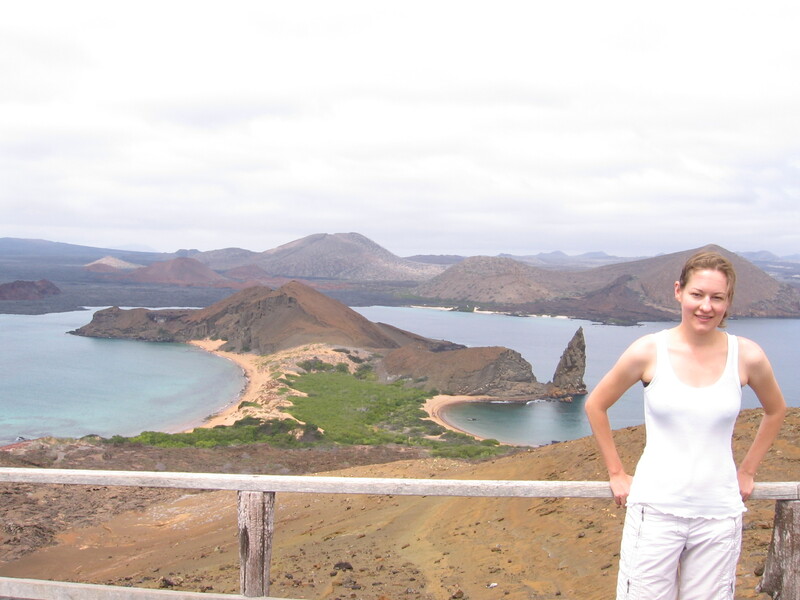 I just got back from the Galapagos, and it was a surreal, torporous, awesome experience. The way things coexist there, the way they just hang out, chill, it’s unreal and at the same time completely natural. Flamingo lagoons behind your hotel? A sea lion teasing a stingray right in front of your snorkel mask? Swimming with a couple of sea turtles? 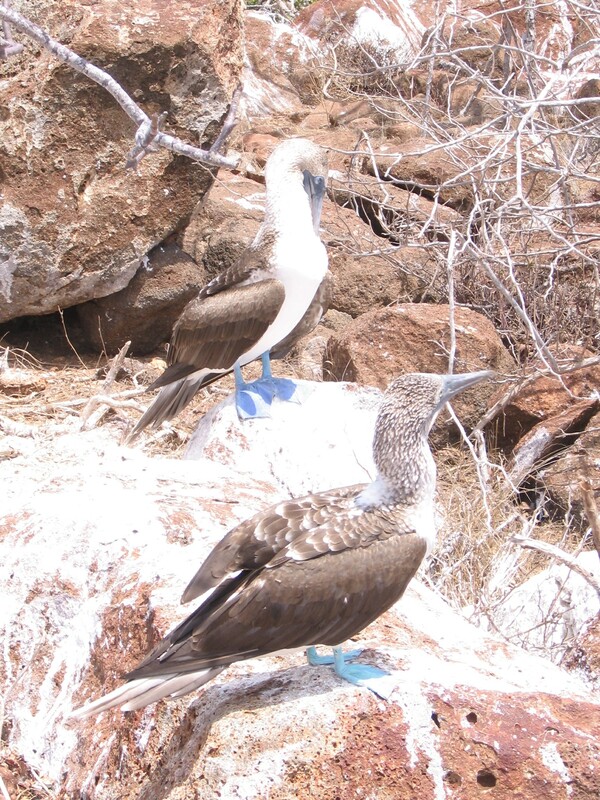 Semi-catatonic birds with blue feet? Why not? There they are. Again and again. This stuff exists, and seeing it makes it real in a way that’s impossible to describe. But I’ll do my best. Forgive me, because I only have time for a first draft, not much editing, research, or forethought. Just off-the-cuff thoughts. This first part covers the first half of the trip. Part 2 will be coming along next week. Hope you enjoy it! My first indication that the Galapagos was not going to be anything like I expected was when our plane flew over the islands. I imagined looking down and seeing a perfect map of the area, from Fernandina all the way to San Cristobal. But when I looked down, I could only see one long, curving coastline and a land area that faded away toward the horizon. Then a stretch of sea. Then another. Hills, trees, beaches, grasses… These weren’t a few small piles of lava dropped in the middle of the ocean, as I had imagined: flat, ravaged landscapes full of turtles roving through brittle grasses, broken rocks, and cacti. There were definitely roving turtles, brittle grasses, broken rocks, and cacti. But there were also lush cloud forests and endless hills that stretched on for miles. I should have known better. The West Bank looks pretty tiny on a map, too. But I lived there for two years and didn’t come anywhere near the end of things to see and do. A couple dozen kilometers doesn’t sound like much when you’re from Oklahoma. But when you walk 26 kilometers around two volcanoes and realize you’ve only explored a tiny thread around one tiny part of one island, the distances take on entirely different dimensions. 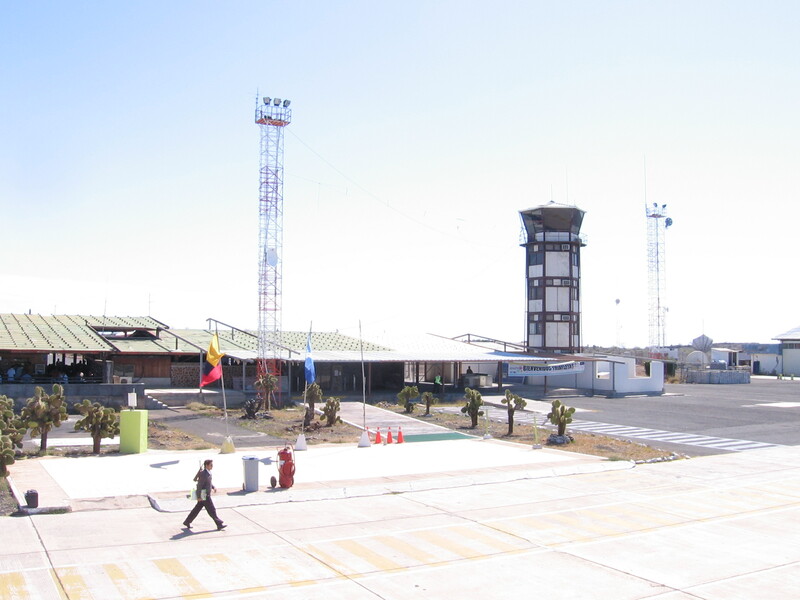 The second inkling that the Galapagos wasn’t anything like I expected was the airport we landed in on Baltra, a small islet north of the central and most populous island, Santa Cruz. I expected a modern, gleaming edifice used to handling millions of rich tourists from all over the world. It didn’t even have walls. It was, in fact, the most pathetic airport I’ve ever seen, and that includes the two-gate affair in Ft. Smith, Arkansas and the bombed-out airport in Gaza. 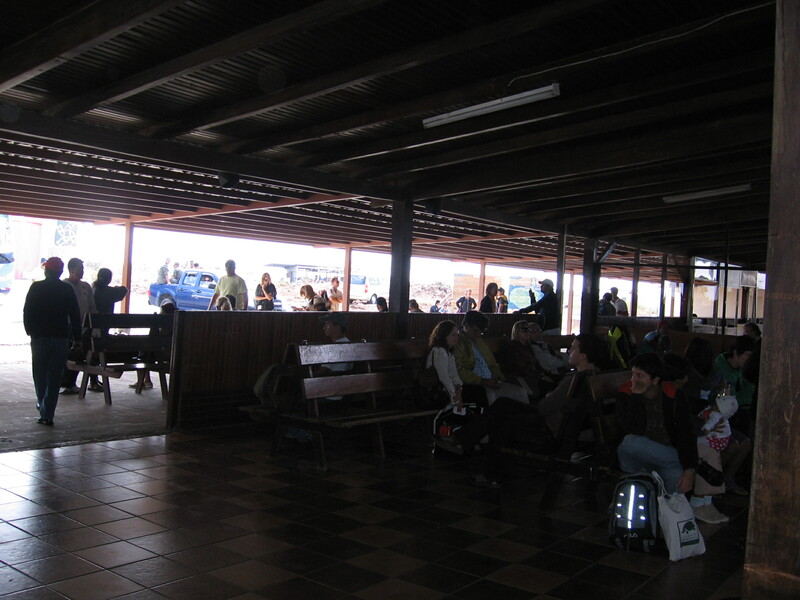 We walked from our plane to the airport/shack and looked in vain for the luggage carousel. There was no luggage carousel. Just a sectioned-off area where a few men without uniforms were carting everyone’s luggage and dumping it on the floor. After all the luggage was dumped, we were allowed to swarm in and claim our bags. But the informalities ended there. On the way out, a man in uniform inspected our luggage against the little claim stickers we’d been given in New York—something I’d never seen anyone do at any airport in the world. I had the feeling my luggage would never have left the airport if I had lost that sticker. A free bus picked us up outside to take us to the southern end of the island, where we would catch a ferry across a narrow channel and take another bus or taxi due south to Puerto Ayora, the largest town in the Galapagos on the southern tip of Santa Cruz Island, with a population of more than 10,000. The bus ride took several minutes across a landscape that looked like a broken-down empty lot with piles of rocks and bricks scattered among parched-looking cacti. It was near the end of the cooler dry season, which meant things were at their most desiccated at the lower elevations near the coasts. The weather was sunny and balmy with an easy blue sky, and after weeks of formless anticipation and hours of bleary travel, this crazy vacation suddenly seemed, almost, real. The channel between Baltra and Santa Cruz was filled with pale turquoise water, and a water taxi took about 40 of us at a time across. People were already snapping photos of the frigate birds—those elegant black pirates of the sky with the red air pouches under their chins who can’t get their feathers wet and thus have to steal fish from other birds to survive—and sea lions lounging on buoys. I was traveling with two friends of a friend from Stanford, Adam and Patrick. We decided to take a taxi into Puerto Ayora since it was only $15, and by taxi I mean a white Toyota pickup truck. Our driver was friendly and didn’t speak English, but Adam and Patrick both spoke decent Spanish, and the driver was constantly pointing out interesting things to us. 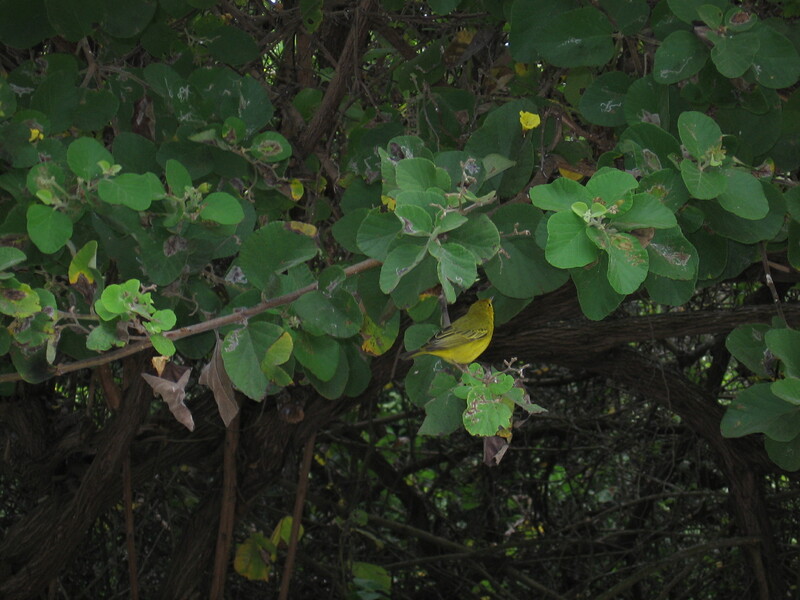 The dry coastal area quickly gave way to misty clouds and increasingly rich greenery until we were surrounded by what looked like a Jurassic jungle. I wouldn’t have been at all surprised to see a Brontosaurus poke his head up above those prehistoric-looking trees. What we saw instead were occasional cows in clearings and fields, each accompanied by a snow-white heron (they apparently liked to let the cows stir up grasshoppers), and dozens of giant tortoises scattered like boulders across the landscape. 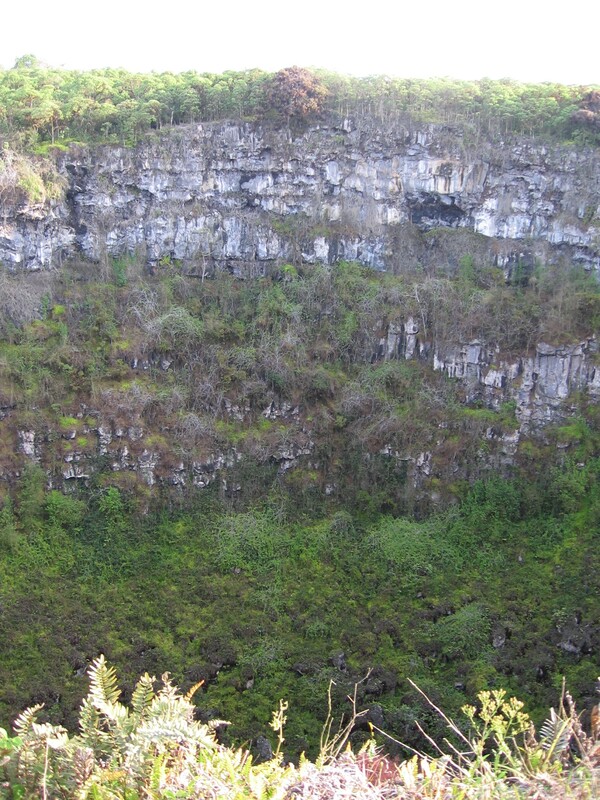 We also passed two deep craters that had been created by collapsed lava tunnels. The road was built across the ridge that passed between the two craters, which made me wonder exactly how safe the road was. I had deliberated with myself for weeks about whether or not to take this gratuitous, expensive trip, and by the time I held my breath and closed my eyes and clicked “Buy tickets now” on the airline website, the hotel the boys were staying in had been fully booked. 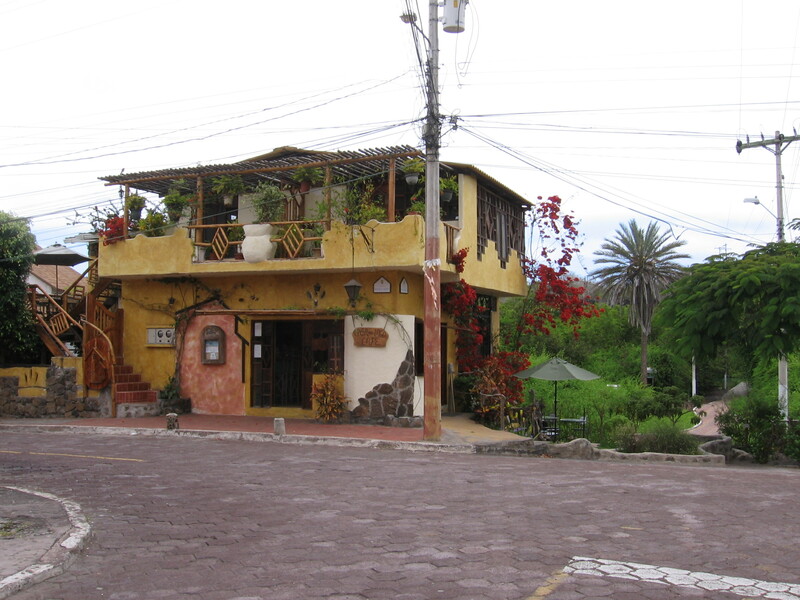 I found a bed and breakfast a couple of blocks away called La Peregrina, and when we got into town, we split up to freshen up and settle into our new digs. I had some time to kill before I was supposed to meet the guys for lunch, so I walked down to the water front by my hotel and was met with an enchanting sight. Near a little marina was a landing dock where the day’s catch was boated in, and a man was standing at a counter beheading and gutting huge fish (some of which I would no doubt be eating that evening). Surrounding him were at least a dozen giant pelicans and a cheeky sea lion begging at his knees like a dog and otherwise galumphing around fighting the pelicans for juicy, bloody scraps. None of the animals had any fear of the humans. 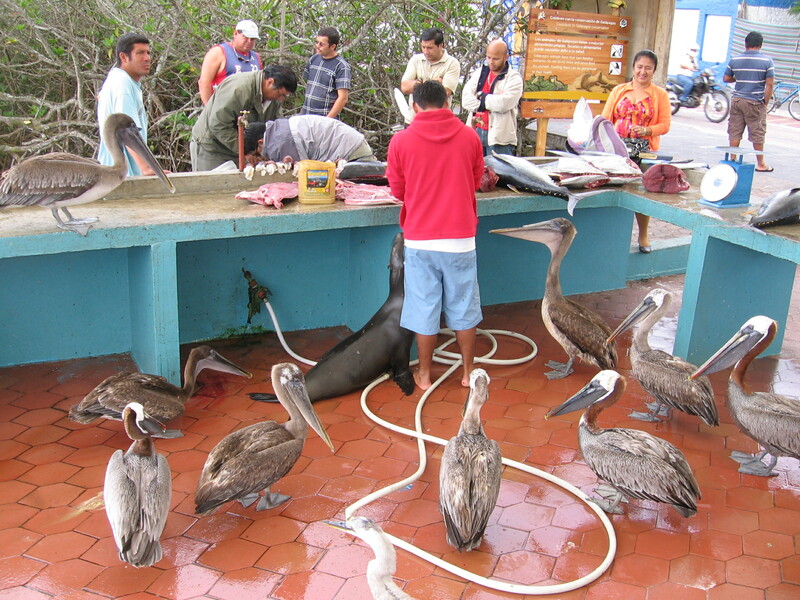 Every now and then the guy gutting fish would turn around and wave his arms to try to get the animals to leave him alone, but they’d just move a few feet away, then move right back within twenty seconds. Frigate birds wheeled overhead, waiting for any of the other scavengers to drop their guard, and pelicans with too much dignity to beg for scraps were sitting heavily in the surrounding leafy trees like giant Christmas ornaments. It was one of the most intimate and natural wild animal-human interaction scenes I had ever seen. Reunited with the boys and stuffed full of cilantro beef stew and bolones (balls of mashed plantains and butter), we walked east to the Charles Darwin Research Station to see the giant tortoise breeding center. We first saw cages with baby giant tortoises in them, already the size of full-grown North American tortoises, then the path took us to huge enclosures full of trees and boulders and feeding platforms where tortoises munched on leaves and cactus pads or just sat around waiting ’til hunger struck again. 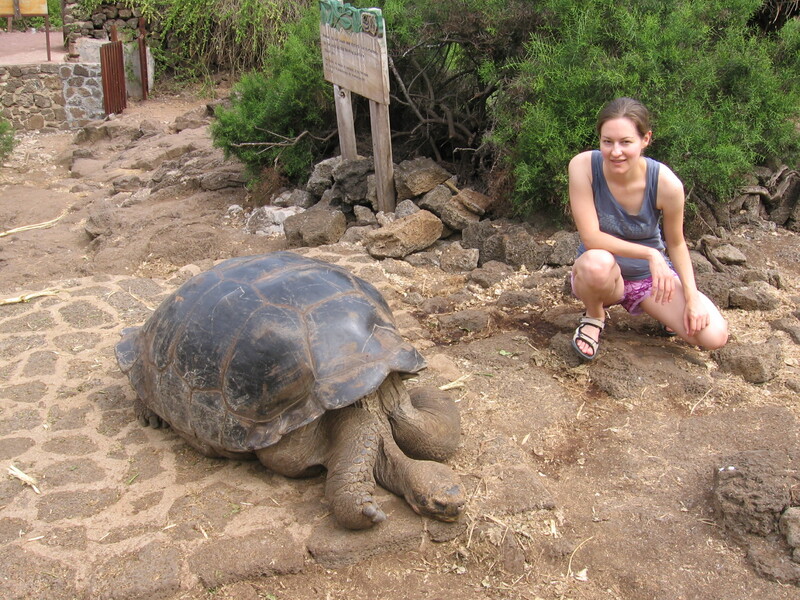 It’s a pretty chill life to be a giant tortoise, with no natural predators and abundant greenery all around. The reason the breeding center is needed, of course, centers around those dangerous and destructive interlopers, human beings. Not only did pirates and sailors nearly eat the tortoises into extinction in the days of wooden sailing ships, they also introduced rats and dogs and goats and other nasty newcomers who drastically altered the island ecosystems. Now many tortoises need to be coddled into adolescence in order to have a fighting chance in their native stomping grounds. 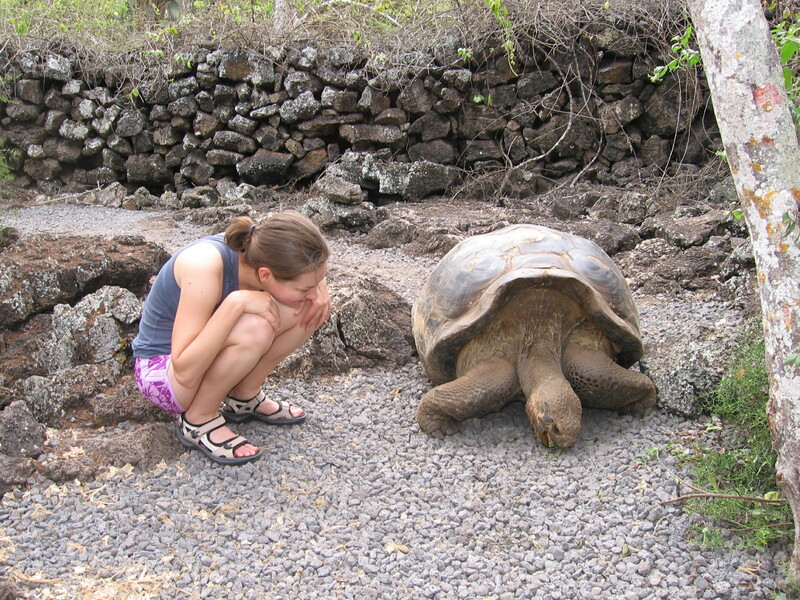 The most famous tortoise is named Lonesome George, the rarest living creature on earth. He’s the last of his subspecies from the island of Pinta, and though he’s been living with three fertile females from a slightly different subspecies, much like Hugh Hefner, he has yet to produce any offspring. We tried to catch a glimpse of the famous recluse but could only see him (barely) with binoculars hiding far from the tourist path. 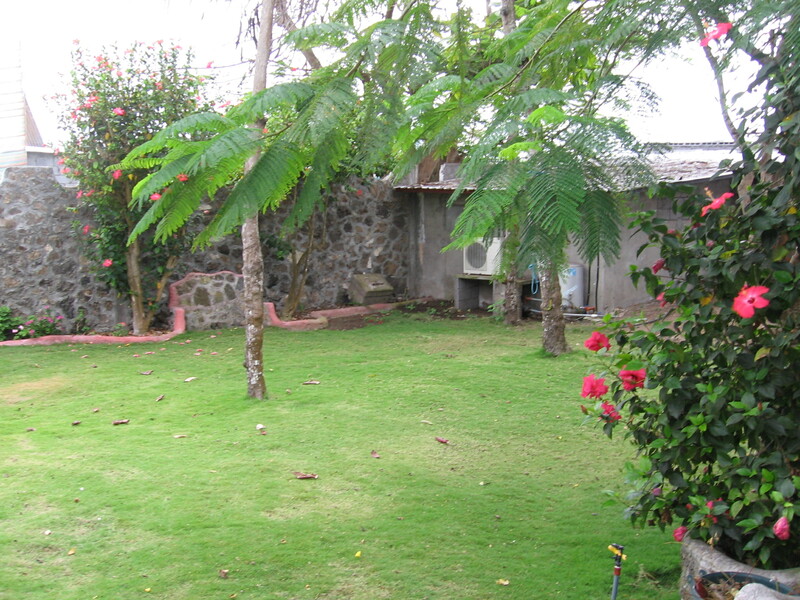 The other attraction near Puerto Ayora was Tortuga Bay, a white sand beach west of town, a 45-minute walk down a forested pathway paved in volcanic stone. 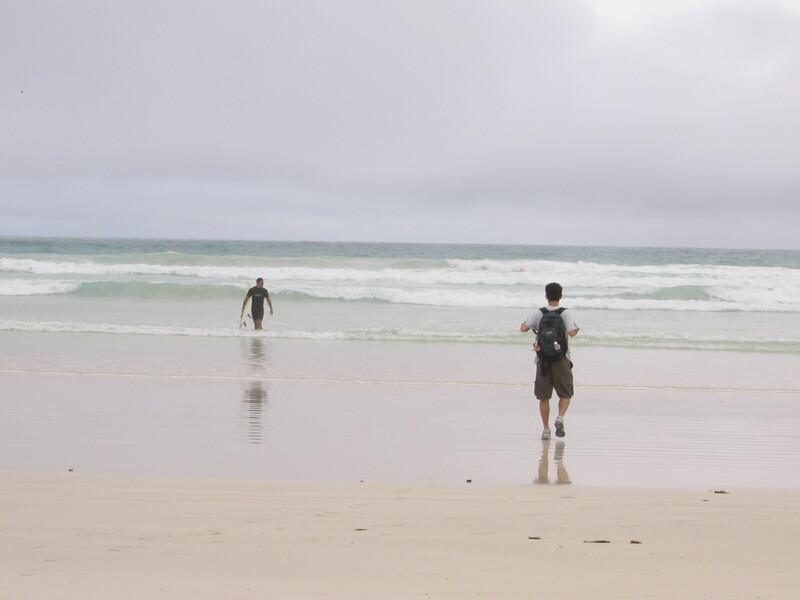 It was cloudy when we got there, casting everything in shades of grey, but the crystal clear aquamarine water and white sand beaches must be heartbreakingly beautiful on a sunny day, and we enjoyed a walk along the surf. For dinner we went to Charles Binford Street, a section of road blocked off and filled with tables from a dozen different restaurants lining the street. We picked one more or less at random, and I had a lovely fish steak with rice and beans and a small salad (the default meal in the Galapagos), and the boys went for a terrestrial grilled meat plate in the charming, festive, congenial atmosphere. A tourist bus picked us up at our hotels and took us back up north to the channel between Santa Cruz and Baltra, where a party barge picked us up and motored us up north. We were the only three gringos on the boat, and though our guide spoke pretty good English, he seemed mildly annoyed that we were making him use it so early in the morning. 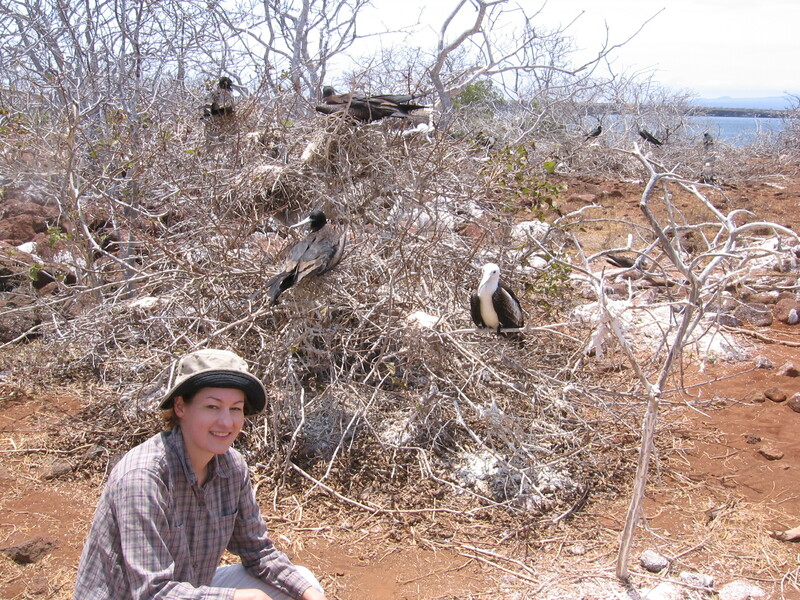 Which brings us to another surprise about the Galapagos islands—almost nobody speaks English. 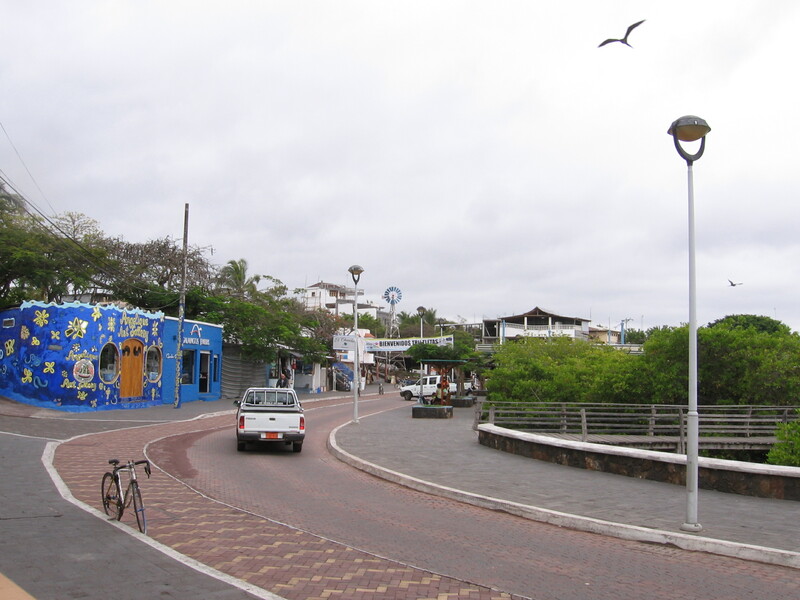 I knew from all the readings I had done about the Galapagos that conventional wisdom said independent travel was difficult if not impossible here. All the books said you’d better book a minimum $200-a-day cruise for at least eight days, otherwise… Well, they didn’t really offer alternatives, so independent travel seemed like a chimera, an abyss. It just wasn’t done. Well, I had decided to go to the Galapagos based on the fact that the plane tickets were really cheap during a special promotional deal in the off-season, so spending nearly $2,000 on a cruise wasn’t on the agenda. And the boys were only staying for four days, which meant a cruise of any kind would be pretty much impossible. So independent travel it was. And for the most part, it was perfectly fine. The hotels cost about $25 a night, the excursions cost an average of about $80 each with a lovely fresh lunch and guides who spoke at least some English (we probably could have gotten better deals with a little bargaining), and huge dinners could be had for $10. It was a little stressful setting everything up and making sure to meet our buses on time, and after the boys left I moved to a new island and a new village, which had its own logistical hassles. But it all worked out just fine for an average of about $100 per day, all inclusive. So bottom line, if you just want to relax, and if you want to see the more remote islands like Genovesa and Espanola, and if you have a little money to spend, by all means book a cruise. But independent travel is totally possible. Still, to call my Spanish skills basic would be a grave insult to the word ‘basic.’ But since Spanish is the default foreign language in the US, and I grew up learning words on Sesame Street and reading bilingual signs and watching Pedro Almodovar films, I know just enough Spanish to sound like a total idiot. It would almost be better if I spoke no Spanish at all. When I went to South Korea for four days in 2000, no one expected me to learn anything more than “thank you” in Korean. If someone tried to speak to me in Korean, I was completely and contentedly helpless. It just wasn’t gonna happen. But with Spanish, I can start a conversation and then get utterly lost, mangle a question and not understand the answer, say verbs in the wrong tense and conjugation, use female words when speaking to males, and generally sound like a learning-impaired four-year-old. It didn’t help that when I tried to think of a word in Spanish, the thinking instrument in question was already loosely filled with French, Russian, and Arabic, which would all compete for my tongue along with, for some reason, Italian. I only know about twenty words in Italian, but they kept popping up in front of their Spanish equivalents like annoying kids in front of the TV. So I often felt like a frustrated deaf mute without the little card explaining about my condition. But people were friendly, and although I couldn’t always order exactly what I wanted or have deep and nuanced conversations with Spanish-only-speaking people who seemed totally cool and interesting, I could ask where the bathroom was and where the boat was and where the sharks were, and it all worked out just fine. Back to the boobies. We scrambled off the boat onto a rocky ledge and walked up a path to a plateau filled with red volcanic rocks and bare trees. 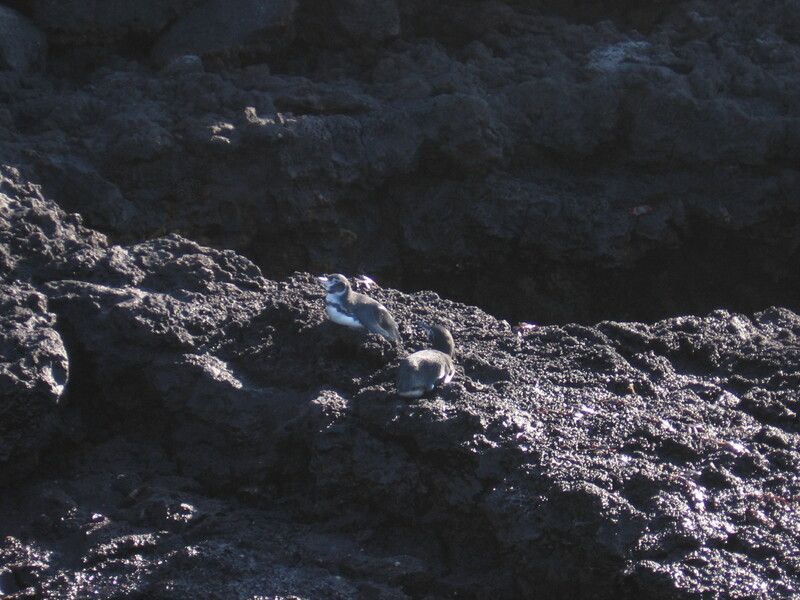 With the white guano covering the rocks, the silvery branches, and the fuzzy baby birds, the whole thing had a wintery feel despite the beating sun and Equatorial heat. 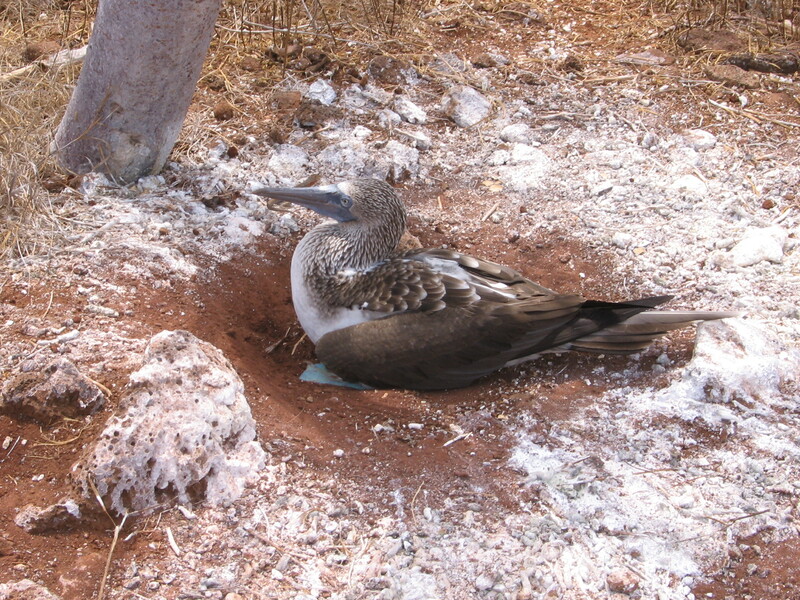 Catching our first glimpse of a blue-footed booby sitting in its little scratched-out nest in the ground was a revelation. To my surprise, there was nothing comical about the booby—nothing that would seem to make it deserve the name. (Of course, I didn’t see the courtship dance.) They looked cartoonish in a way, and they weren’t afraid of humans, and their feet were indeed a shocking shade of blue, and they did this thing where they nodded their head quickly and clicked their beak that was a bit strange the first time you saw it. But overall they were quite chill and regal-looking. I liked them very much. Then we rounded a bend and saw two more boobies, then three more, and pretty soon the blue-footed birds, looking semi-catatonic and barely interested in the paparazzi flowing by as little as two feet from them, just seemed like a natural part of the landscape. 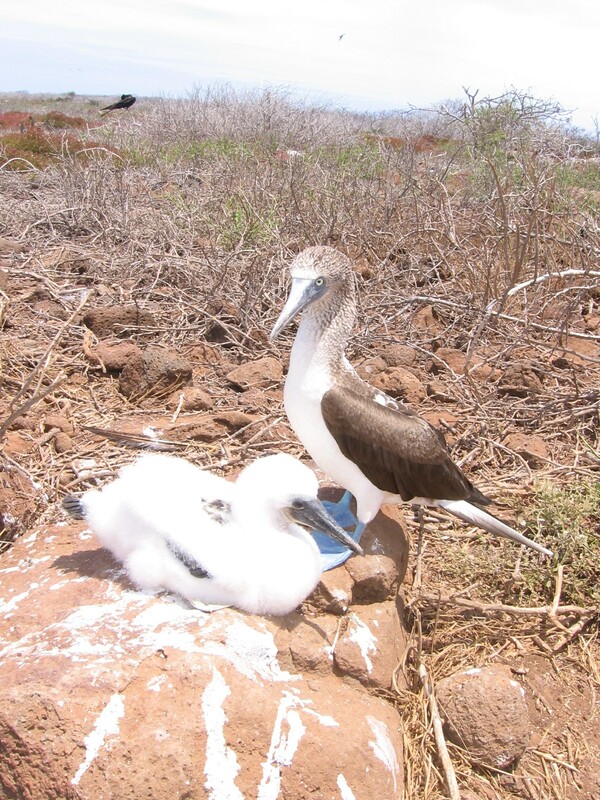 When we saw the first fluffy, awkward adolescent chick, almost as big as its parents, there was again much exclamation, as if we had made a great discovery. By the time we had seen about fifteen of them, along with dozens of frigate birds and their chicks chilling in the trees, only the die-hards were still snapping photos. 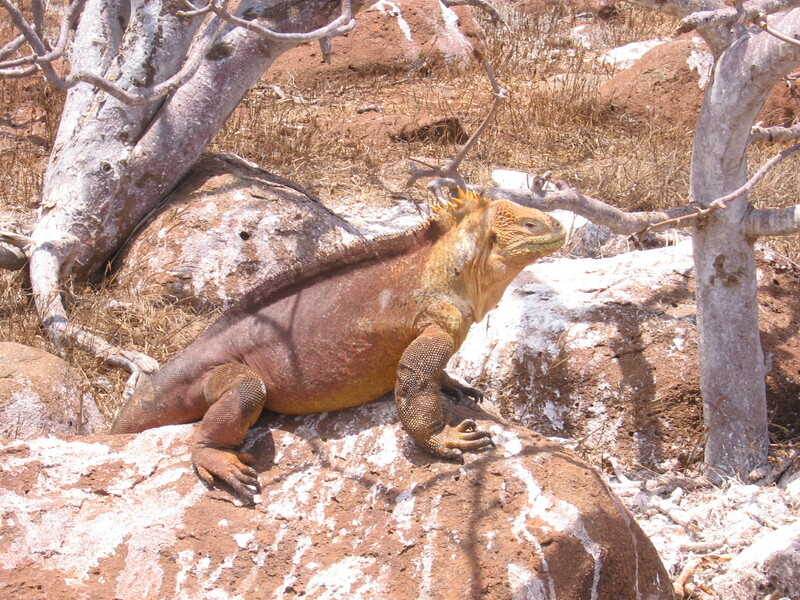 We also saw three-foot-long land iguanas with dusty brown bodies and golden heads sunning themselves on rocks or lounging around cacti. 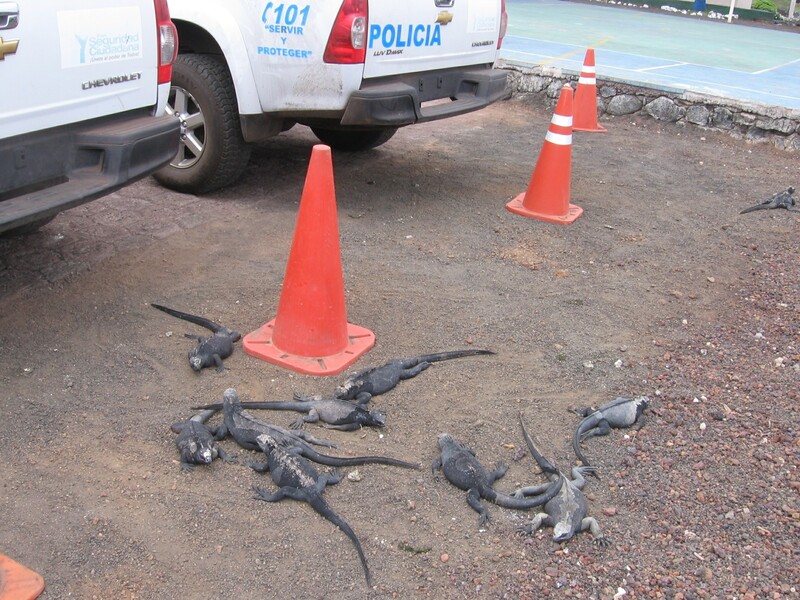 Along the beach, we saw black marine iguanas lying on black lava rocks, recovering from their cold dives for the red and green algae they subsist on. They take in too much salt with their diet, which they expel through special glands in their noses in occasional charming little sneezes. All were just as blissfully unconcerned with us humans as the birds as long as we didn’t get closer than about a foot or move too fast, at which point they would fix us with a witheringly irritated look and scramble away. Darwin apparently thought these guys hideously ugly, but I never got tired of looking at them. They weren’t pure black, though. They were exactly the same shade as the lava rocks, a kind of dark slate grey, and their skin even had the little white spots and imperfections that the lava rocks had. I turned to Adam and said, “I know how evolution works, and I know it takes millions of years.” I shook my head. “But that is sick.” He smiled. As we were heading back to the boat, we almost stepped on a baby seal that was sitting in the middle of the path, waiting for his momma to come back with a belly full of fish and milk. The fuzzy little guy was one of the most painfully cute things I’d ever seen, with eyes so dewy, I was inclined to suspect he had been custom designed by Precious Moments. He was as gentle and helpless as a newborn kitten, and all he could do was wag his head around and blink and hope the world was kind. Our group headed to a nearby beach after the usual lunch of fish steak with lime wedge, rice, salad, and fruit juice. 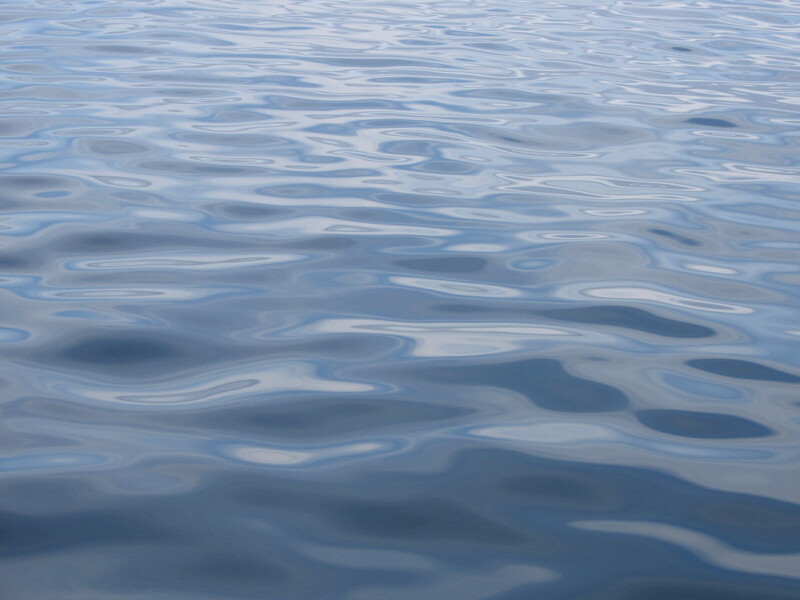 The water was cold and the boys said the snorkeling wasn’t great, so I just sat on the sand and took in the beauty. A pelican with a five- or six-foot wingspan was wheeling around and diving in the water for fish. Every now and then he would fly to the beach and glide low over the sand, probably warming his cold, wet wings. Sometimes he would come within three feet of me on his glides, heading straight toward me like a flying lance, then at the last minute veer past me. The next morning would start even earlier—5am. 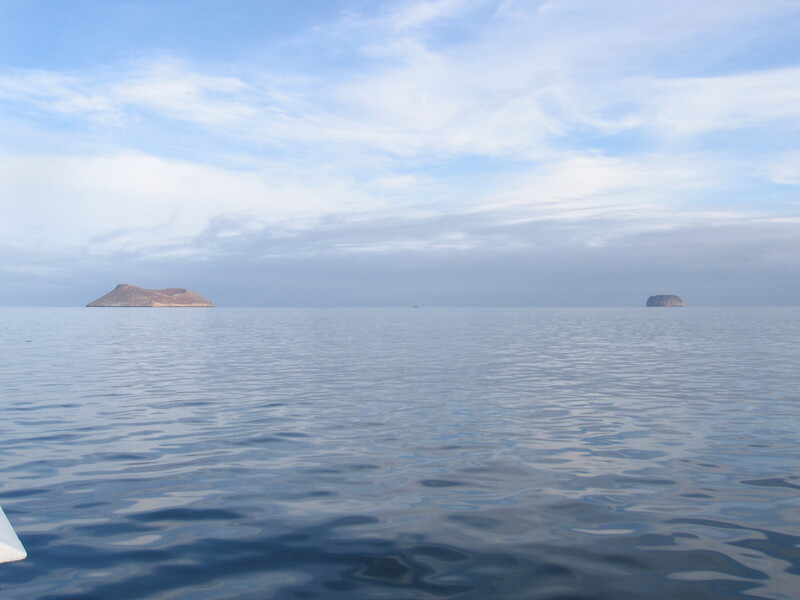 Our destination: Bartolome, a tiny volcanic islet just east of Santiago. The boat ride there took three hours, after a 45-minute bus ride back up north again. Dawn was breaking just as we departed, which must have been at precisely 6am, because that’s when the sun rises every day on the Equator. And the sun sets at 6pm, every day. It was a strange and rather unsettling prospect to think of a land where the time of the sunset never changes. There’s no thought of daylight savings time, no late summer nights, no dark winter afternoons. Also, the sky seems smaller with the sun always traveling in its one close arc of least distance from horizon to horizon. The nice part was that unless it was high noon, you always knew exactly where the cardinal directions were. No factoring in the sun’s southerly projection depending on the time of year. East and West were exactly where the sun’s arc pointed, always. It was a windless dawn, so instead of the usual waves reminiscent of miniature craggy peaked mountains, the sea undulated like a flowing mirror reflecting the slate shades of the dawn sea and cornflower sky in distorted concentric circles and swirls of color. We passed Daphne Major and Daphne Minor, the islets famous for the finch research done there, and disembarked at Bartolome, where we walked up a wooden staircase built into a small volcanic cone and looked out over one of the island’s most famous vistas, a tiny islet with a pinnacle of rock connected to Bartolome by a narrow isthmus of mangrove forest and beaches with Santiago in the background. We traveled next to the beach on the right side of this photograph, famous for its sea lion colony and tropical penguins. We passed a couple of the penguins chilling on the rocks along the shore, cute, tiny things who took a very wrong turn from Antarctica somewhere in the distant past. 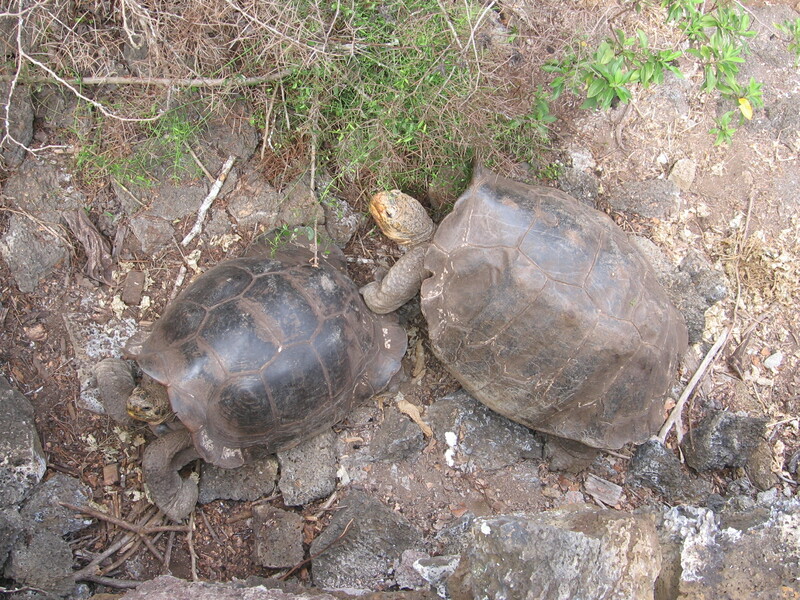 Evolution has disabused them of much of their girth, but they still cluster near the western end of the Galapagos, where a cold, rich ocean bottom current wells up and gives the Galapagos both a break from the usual unrelenting heat of the Equatorial region and the abundance of marine life that sustains much of the rest of the life on the islands. They looked like they were almost sweating sitting around on those rocks in Bartolome. 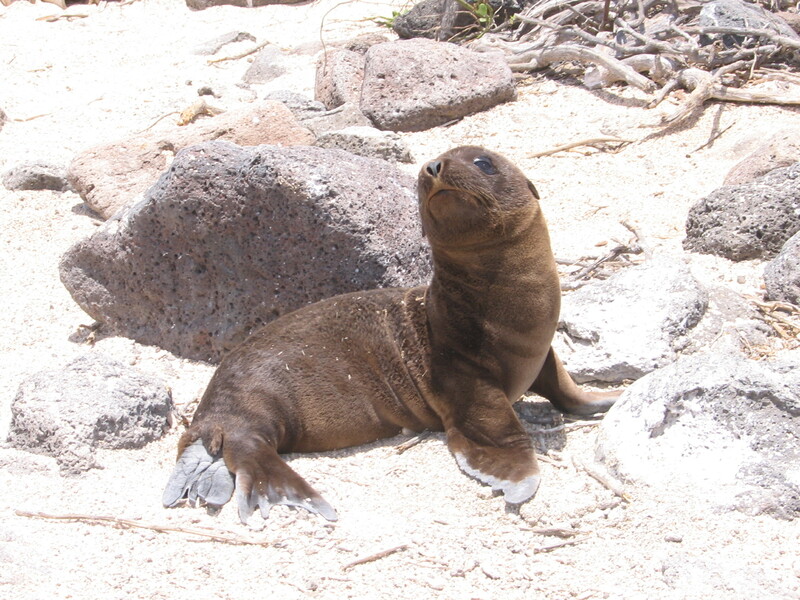 A few sea lions were lying about on the beach when we got there, and some folks posed with them and got pictures while I put on my snorkeling gear and got in the water. I was making my way around Pinnacle Rock toward a more remote beach on the other side, taking in the colorful tropical fish along the way (remarkably similar to the variety offered up in the Sinai), when I suddenly remembered—there were sea lions right by where I’d entered the water. If I went back, maybe I could swim with them! I made a quick about-face and swam back to the beach toward the sea lion resting place when suddenly an inquisitive face popped up about two feet from my snorkel mask, and then started to come even closer. I was unprepared for this, suddenly terrified, remembering something I’d been told about male sea lions being very territorial and imagining my arm being ripped off by a 500-pound pit bull that swims like a fish. I spazzed out and scrambled onto the beach faster than I’ve ever done just about anything in my life. Of course it had been a female and I was in no danger, but the first time a giant marine mammal is two feet from your face and you’re breathing through a tube, totally on their turf, maybe you’ll know what I’m talking about. As we were powering our way back to Santa Cruz, the boat was suddenly surrounded by half a dozen dolphins playing in the waves and racing around our boat. Then a few hundred yards off the bow, a huge ray suddenly leapt out of the water, an awkward but beautiful writhing diamond of glistening brown-grey flesh glinting wetly in the sun before flopping into the water on its back. I asked the guide if he was doing that to catch fish near the surface. He said, “No, they do that to try to get the parasites off their backs.” I guess every cloud has a silver lining—the silver lining of these parasites is the spectacle of leaping rays. We flopped down all over the boat for an afternoon sleep during the trip back, even though almost everyone had already caught up on their sleep during the trip there in the morning. It was a deep, dreamy, indulgent sleep, a shamelessly recreational sleep, a three-hour alternative to an unnecessary cup of coffee. When I woke up once and looked around, I couldn’t help but think we looked rather like a colony of snoozing sea lions. I guess the Equator has that effect on you. 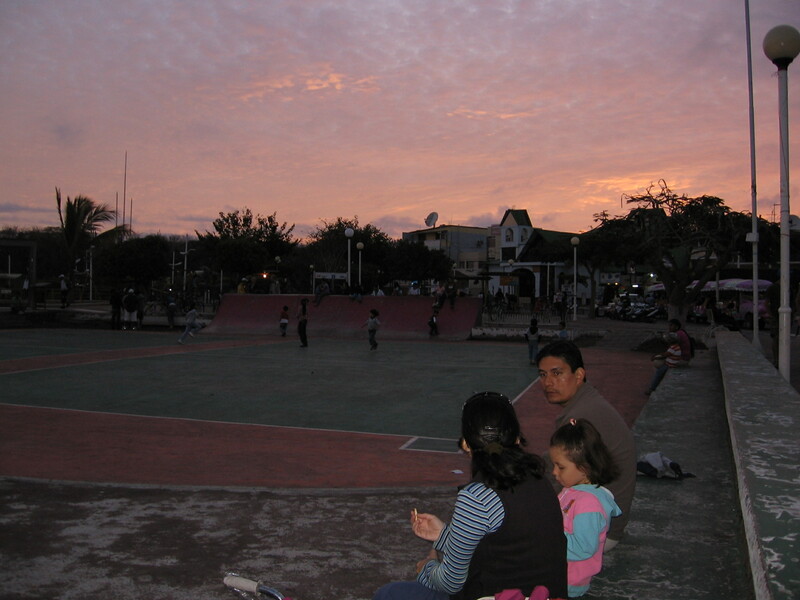 Back in Puerto Ayora, I went on a walk around town, which looked remarkably similar to an Egyptian Sinai village, with square cinderblock houses, outdated utilitarian vehicles (mostly small white pickup trucks), and Bob Marley playing in open-air cafés. The locals, unless they were directly engaged in tourism-related activities, generally ignored us, as if we were just another funny-looking, tame species, harmless as long as you didn’t try to touch them. 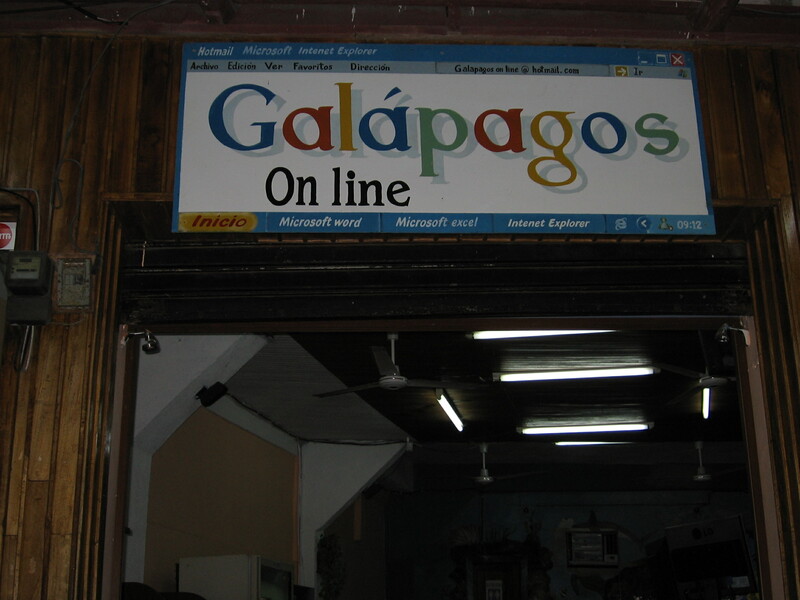 I’m heading to the Galapagos for the next ten days, pretty randomly. A few months ago, a friend told me about improbably cheap tickets to the famous islands in the low season in October. The power of suggestion was too much for me. So was the thought that I haven’t been anywhere but the US and the Middle East in the past seven years. My traveling toes were itching. I’ll be doing the budget thing with day trips and hostels. 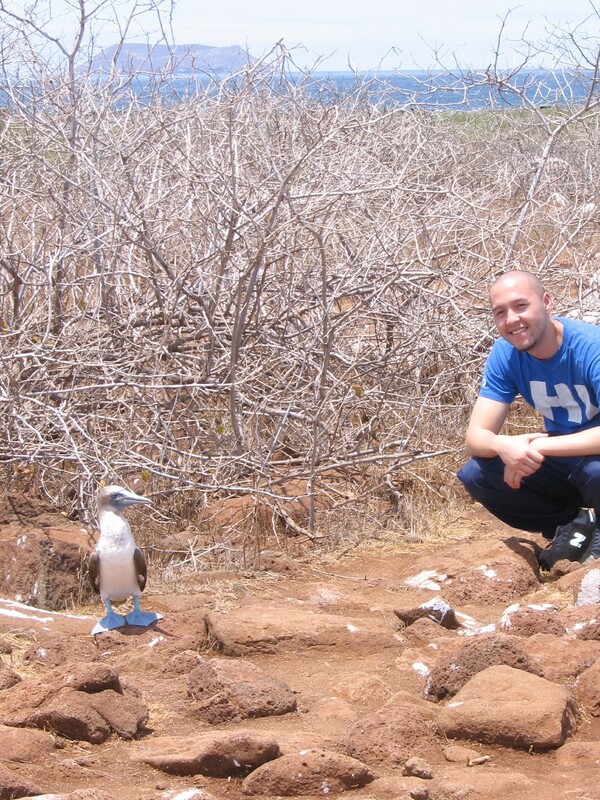 If you know anyone or anything about the Galapagos, feel free to send it my way.